Three brass and aluminum combination wheels provide 1,000,000 theoretical combinations. Dual brass locking cams prevent wheel slippage. Solid brass locking bolt and zinc drop lever. Four-way brass drive cam allows mounting RH, LH, VU or VD. Internal spring-loaded brass relock trigger guards against punch attacks. Standard mounting footprint matches most mechanical and electronic safe locks. Large front-read convertible dial and ring. Both dial and ring are die cast with black finish and white letters. A solid, machined brass spindle – 4 7/8”. 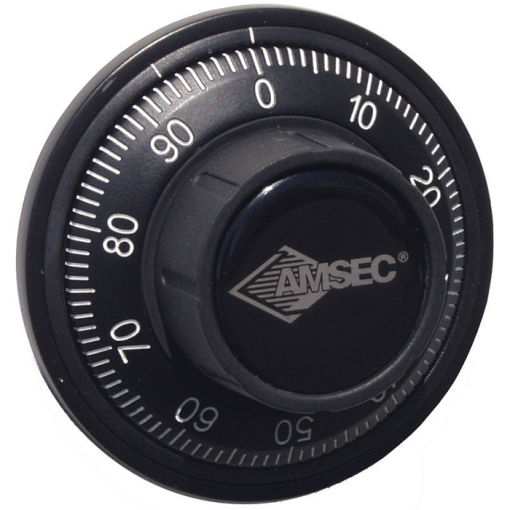 Can be converted to a key-locking dial with a disc tumbler key cylinder and two keys.Comes standard with an attractive self-stick solid dial insert or a key-locking dial insert.